Could you be a Dickensian Character? Would you like to come to the Festival dressed as a character from a Dickens novel? We are often asked 'What do you have to do if you want to be come to the Festival in costume?'. The simple answer is 'Go for it!' 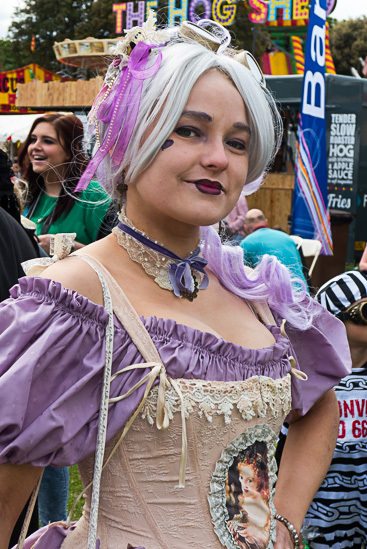 Anything goes, but as you will see at the Festivals, most 'characters' put a lot of effort into either portraying an easily identified character from a Dickens story, or dressing in the style of a fashionable early Victorian on a day out. We are very happy to welcome steampunks to our numbers, and the Great Kentspectations group are always part of the festival parades. If your sewing skills are limited all is not lost. You might find what you want at the annual costume sale held each year in Rochester in May and November - the details are posted on our News page as soon as we have them. You will find specialist suppliers on the internet, often selling through Ebay or the Amazon market place, often direct from China, and often quite cheap (but check delivery times for imports). Occasionally you will find a charity shop outfit that you can adapt. There are some useful internet shopping links on our Resources page. If you are doing an internet search, good search terms include 'Victorian steampunk dress' and 'Victorian fancy dress', but be prepared to sift through a lot of results! If you want to go the extra mile you may decide to wear a Victorian corset (in Victorian times this could include the gentlemen, especially in military circles!). This is by no means required, but it helps enormously in giving an outfit the classic Victorian narrow waist and upright stance. Any 'proper' corset will have steel stays. An 'off the shelf' steel boned corset will do a good job without costing a fortune, but the 'made to measure' equivalent will achieve a more dramatic profile without being too uncomfortable. If you want to make your own it isn't easy but the materials are out there and it can be done. Whatever decision you make, it needs to be taken before choosing your outfit, as some corsets can reduce your waist by four inches (10 cm) or so. There are links on our Resources page.